With deluxe artistic approaches to lettering becoming more of a mainstay in day-to-day tattooing, BJ Betts's books provide ways of keeping things interesting, customizing it, finding your own flow and your own style. His explanations are clear, simple, massively useful, and written in a down-to-earth style that's easy to relate to. 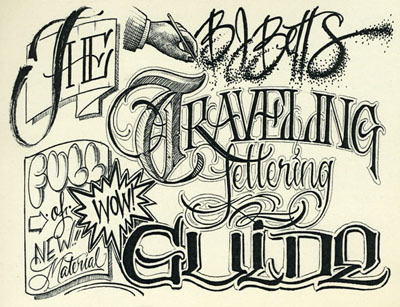 The BJ Betts Traveling Lettering Guide boils down some of the most important aspects of designing good custom lettering into a small pocket-sized guide that's sure to get a ton of mileage. In addition to many pages of technical advice about layout, it provides numerous different scripts, banners, flourishes, effects, different variations on letters... And its on-the-road format makes it even more useful. The only way this book won't improve your lettering is if you don't open the cover. 82 pages, 5x8", spiral bound on durable heavy card stock.